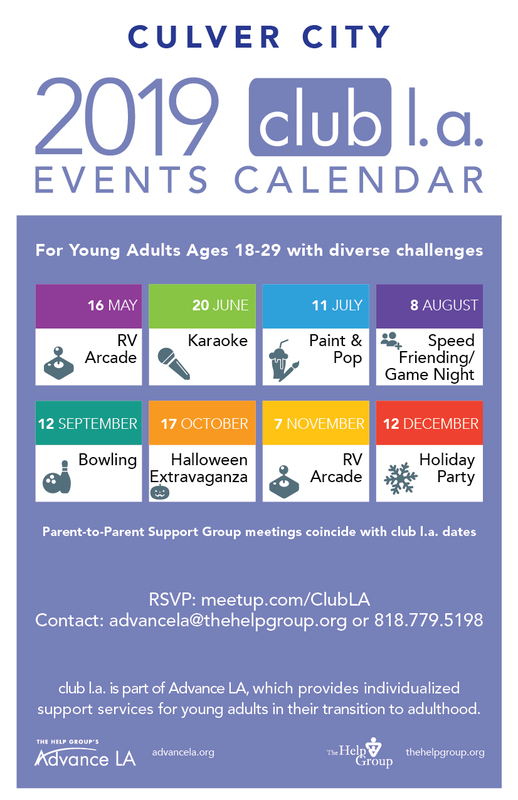 club l.a. is a vibrant social community for young adults, ages 18 to 29, who have diverse challenges. It is a great opportunity to make social connections with other young adults with common interests and is structured to ensure a positive experience for everyone. club l.a. events take place every month throughout LA County, and there is a nominal fee to participate. For more details on upcoming club l.a. events and to RSVP, please visit our page at www.meetup.com/ClubLA. Parent-to-Parent Group: At the same time and in close proximity to the club l.a. event each month, Advance LA hosts a Parent-to-Parent support group. If you are a parent or care-giver and would like to learn more or RSVP, please reach out to Jeri at jrochman@thehelpgroup.org or (818) 779-5229. Event dates are subject to change. For more details on upcoming club l.a. events and to RSVP, please visit our page at www.meetup.com/ClubLA.